Most kids are not big fans of going to the dentist. Actually, most people are not excited about going to the dentist, but understand that regular check-ups are essential for good dental health. So what do you do if your child is afraid of the dentist? What can parents do if their child’s fear of going to the dentist is so great that’s it becomes almost impossible to get them to go? Below are some tips to help ease your child’s fear. Like most uncertainties in life, not knowing what’s going to happen can create a lot of fear. To help with that, many parents have found that if they create a make believe dentist visit at home, the child becomes more comfortable with what to expect. As a parent, you can play the dentist, sitting your child in a comfortable chair, asking them how often they brush, do their teeth hurt and other questions while having them open their mouth so you can examine their teeth. Make it fun for the child while going through the motion of a typical visit to a pediatric dentist. Show them how to use a brush, use dental floss, etc. The more you can role play what an actual visit to the dentist will be like, the less anxious your child will be about the dentist when their check-up is due. Whether you’re describing your child’s upcoming visit to the dentist, or discussing your own recent visit to the dentist, refrain from using any words that could cause excessive fear, such as “needle,” “drill,” or “pain.” You don’t want to create any preconceived notions in your child that a trip to the dentist will be painful; that will only elevate their anxiety and fear. The earlier a child has their first visit to the dentist, the better. It’s best that the first visit starts at age 1 or when the first tooth is visible. Get them used to the routine of going to the dentist, and eventually it will become a good lifelong habit they’ll take well into their adult lives, and will do so without fear or anxiety. Knowing pediatric dentists understand the fear children have of going to the dentist. Some dentists will create fun games, contents or an iBrush Club so kids get excited about going to visit the dentist. There are actually several books for children that are about going to the dentist. They include, Show Me Your Smile! : A Visit to the Dentist by Christine Ricci, Just Going to the Dentist by Mercer Mayer, Behold! No Cavities! : A Visit to the Dentist by Nickelodeon, and Tooth Trouble by Jane Clarke. All of these books are terrific at helping the child have a better idea of what it’s like to go to the dentist, and can put their mind at ease. Many reputable pediatric dentists will let you come in and tour the office before an actual appointment. Call your dentist and ask them if it’s OK to bring your child in for a quick visit. Likely they’ll say yes, understanding how a child who is familiar with their settings will be less anxious during an actual visit. Helping ease your child’s fear of the dentist will go a long way in establishing good dental health habits for years to come. 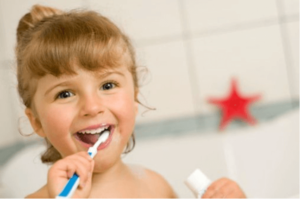 Using some of the techniques provided above can go a long way in helping your child be less fearful of the dentist.